Five years ago, the two candidates headed for the final round of the presidential election in Peru raised fears among friends of the free society. Nobel Laureate Mario Vargas Llosa stated that choosing between them was like choosing whether to die from HIV or cancer. Ollanta Humala, winner of the contested presidential election, is about to finish his mandate, and widespread fears did not materialize. Peru did not die. In fact, several of Vargas Llosa’s allies ended up joining President Humala’s administration. The beginning of Argentina’s decay is rightly associated with the rise of Juan Domingo Perón (1895-1974). Perón became a leading political figure and president from 1946 until 1955, after a 30 year career in the military. In a previous Forbes article I described how he implemented many of the policies of Fascist Italy in Argentina. At his side, Perón had his charismatic wife, Evita Perón (1919-1952). Both Juan Domingo Perón and Evita are still widely revered in Argentina. If friends of liberty are concerned about the Argentinization of the United States, they should look closely at the doctrines and actions of Juan Domingo and Evita Perón. 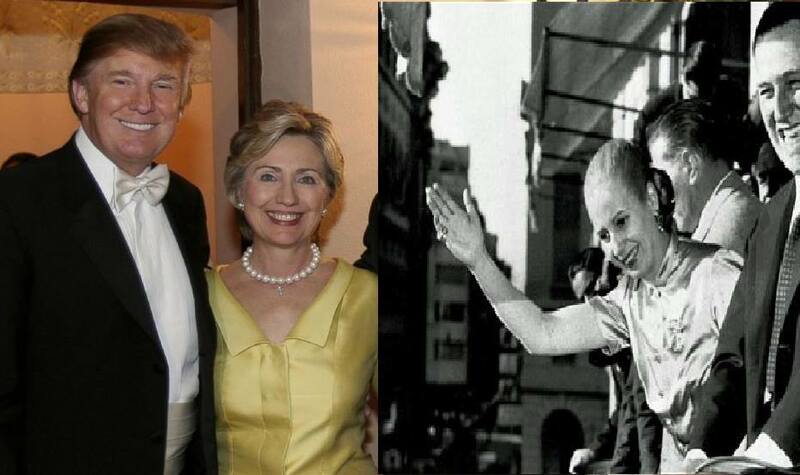 What, if anything, do Donald Trump and Hillary Clinton have in common with the Perón’s personalities and policies. The Times of London once described Juan Domingo Perón as “well-loved and well-hated dynamic, dashing, picturesque, colorful, and often reckless. … Argentina’s most vivid person” (Feb 23, 1946); these descriptors could also be applied to Donald Trump. Like Perón, Trump’s background includes the military; he attended the New York Military Academy for high school and then the University of Pennsylvania. Peron’s 30 years in active military service left a much deeper mark in his character and methods, as did his studies of German and Italian armed forces and political strategy. Evita, in turn, was described by historian David Rock as “this dynamic, captivating, magnetic, but also mercurial and vindictive woman [who] wielded power that was never defined nor formalized, and which was therefore often unchecked and unlimited.” The description fits more Hillary as first lady than in her later, more defined and formal career in government. Perón’s first political party was the Labor “Workers” Party, which counted on support from labor unions. It soon became part of the Justicialista Party, the “social justice” party founded by Perón. Donald Trump’s call for turning the Republican Party into a worker’s party gave ammunition to those who compare him with Perón. But strong labor union support was the backbone of Peronism. In terms of support (financial and otherwise) from labor unions, Hillary is the most Peronist candidate. Peronist focus on a statist and redistributionist conception of social justice also resembles the tone of the ideals championed by Hillary Clinton. Juan and Evita Perón pushed for the growth of the welfare state; their goals were similar to those proposed in 1942 by LordBeveridge (1879-1963) in the U.K. Hillary Clinton’s policies are much more aligned with a welfare state ideology than Trump’s; Trump shuns most ideologies. Take healthcare: In 1946, soon after winning the presidency, Perón pushed for the semi-socialization of the healthcare system. In “charitable” activities, Hillary seems much more “Peronist.” Evita, like Clinton, also had her name on a foundation. Evita’s foundation was created by a government decree and supported by government schemes and private gifts. The numerous handouts and free services offered helped enhance her image and securing for herself the unofficial title of “Spiritual Chief of the Nation.” At its peak (in 1951), Fundación Eva Perón had a budget equivalent to 0.6% of Argentina’s GDP. It was understood that if you wanted to do business in Argentina, you had to donate to her foundation. Trump has yet to occupy political office, so he has more experience in how to “buy” than sell access to politicians. Perón championed rent control, which caused tremendous damage to the Argentinean housing market. There is nothing in Donald Trump’s DNA that would make him push for rent control. Hillary’s plan for affordable housing is based on increased subsidies rather than rent control, but as it plans to subsidize both demand and supply, it will likely increase dependence on government, a typical Peronist outcome and strategy. In the arena of foreign policy, it’s hard to compare Perón’s Argentina with the United States. Perón championed a “third-way” between communism and capitalism; he gave coverage to the Nazis, but did not engage the country in any war. Hillary has voted for wars; Trump has yet to have a chance. In fiscal terms, Perón more than doubled the deficits which went from less than 1% in the previous decade, to 2.5% during his tenure. Government spending in relation to GDP during Perón’s government averaged 11%. It is already double that in the U.S. and both parties are guilty. Hillary has said that if she wins, Bill Clinton will be having an important role in economic policy. Will he repeat his “the era of Big Government is Over?” Does Trump’s supply-side approach indicate that he is a champion of smaller government? It’s hard to say, and this uncertainty continues to have negative effect on the prospects of the U.S. economy. Argentina’s decline was not solely in the field of economics.Transparency International ranks the country 107 among 168 in corruption. One of Perón’s first acts upon assuming the presidency was to impeach five Supreme Court Justices. Towards the end of his dictatorship, he stated: “No justice to the enemy.” He recommended that the courts should rule using the arguments found in the books on the “Peronist side of the library.” I was recently at a meeting where Trump stated to a crowd of conservative leaders that we needed more people like Clarence Thomas in the courts. His praise for the late Antonin Scalia, and his list of potential nominees makes it a reasonable bet that Hillary’s appointments to the court will be more “Peronist” than Trump’s. It would be a sad turn of events if the United States succumbs more to “Peronism” at a time when a new Argentinean government is struggling to abandon Peronism’s worst features. The lethal Peronist cocktail that destroyed Argentina requires a strong combination of statist and nationalist policies. Trump wins on nationalism; Hillary wins hands down on statism. Luckily, neither is extreme in combining both. I see little chance that voters in the United States would put either Trump or Hillary on a pedestal like Argentines did with Juan Domingo Perón and the equally charismatic Evita. As I think my analysis above has shown, there’s a chance that despite not falling completely for a cult of leadership, voters might continue to fall into the trap of supporting the cult of top-down government policies that led to Argentina’s staggering decline.